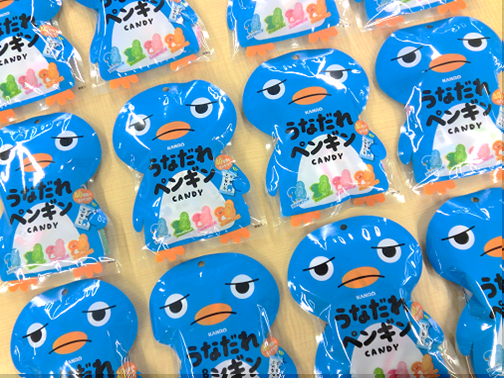 Kanro is selling a hard candy which is supposed to appeal to people who are starting to droop that they can pep up a bit by having their candy. Apparently, one is supposed to identify with the image of the penguin as illustrated. Usually, companies choose to show an aspirational image - what you want to look like - rather than what you already look like. This seems like it would have been a better choice than this somewhat sleep, unhappy, and indifferent penguin. The candy is available at 7-11 and, while Kanro doesn't provide flavor information, you can see four colors on the front of the package that will give you a bit of a clue, though I'd wager on green being melon or apple rather than lime. Personally, I think having this in my desk drawer would tend to make me feel sleepy and depressed rather than make me think this was the place for a sugary pick-me-up. To each their own though. Ahahahahaha "sleep, unhappy, and indifferent penguin." So true! Even this, the penguin looks cute enough.